Watching “Mother!” was one of the most uncomfortably visceral things I’ve experienced in a very long time. Many scenes made my stomach turn in ways I did not think were possible. The emotional trauma lead-actress Jennifer Lawrence must have gone through while making this film must have been unimaginable. However, my reaction is exactly the kind that “Mother!” wanted to elicit from the audience. “Mother!” works on several different levels, speaking not only to ecology, but to the relationship between an artist and their source of inspiration, society’s expectations of a woman’s role as a mother, and the nature of religion. At first, I was hesitant to see this film because of the excessively negative press it received surrounding its central allegory of the Mother as the embodiment of nature. My initial thoughts and expectations were that the film must not be very good if the director and cast felt the need to explain their intentions behind it. I could not have been more wrong. 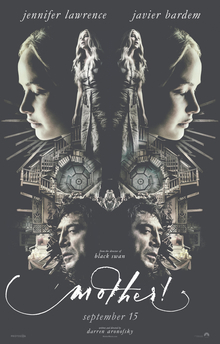 “Mother!,” directed by the famously gut-wrench-inducing Darren Aronofsky, takes place in a secluded, forested home, where Mother (played by Lawrence) lives with her husband, Him (Javier Bardem). Their already strained marriage is tested when their quaint life is interrupted by the arrival of a pair of unwelcome guests/fans, played by Ed Harris and Michelle Pfeiffer. The fans’ arrival helps drive a wedge in an already strained marriage. Whether it is his continued insistence on housing the couple without asking Mother or him asking for their child, Him continues to use and manipulate her. Exploitation is the underlying thread between the many different ideas at play in “Mother!”. The film uses religious motifs, such as references to the story of creation, to make a condemnation on false idols and the exploitative nature of religion. Near the beginning, we see a wound on Harris’ character’s ribs. This is a reference to story of how Eve was created from Adam’s ribs; Pfeiffer doesn’t appear on screen until after this moment. The third act gets very explicit with its Christian imagery as we see Bardem’s character putting ashes on the foreheads of his fans. The film seems to make a similar argument when describing the relationship between artist/muses and motherhood. Him’s fans are enamored with the idea of Mother, but an idea is all she is. The film purposefully strips the character of any personality and makes her passive. But when they perceive her as failing her role as a mother, they are quick to condemn her. They even yell “whore!” and physically attack her. This is meant to show the double standard our society holds for women. Beyond clever symbolism, “Mother!”’s star-studded cast does not disappoint. Lawrence’s performance is nothing short of haunting. The film makes use of several close-ups, giving Lawrence the opportunity to showcase her immense emotional versatility with just her eyes and mouth. Harris adds a quiet menace to his character that is just the right amount of unsettling, and Pfeiffer, deliciously evil and coif, gives one of her best performances in years. “Mother!” is also very atmospheric. From the opening line of dialogue “baby,” the film gives off a disquieting tone that the audience can’t initially pin down. Matthew Libatique (who is Aronofsky’s usual Director of Photography) shot the film. Muted, natural colors contrast and give the film a sense of life. An excellent sound design contributes to the atmosphere. The house and Mother are completely synchronized, as every single audible creak in the house is a manifestation of the mother’s paranoia and desires. There is no score in the film despite one having been originally made by Johan Johansson, and the absence of this adds another layer of suspense. “Mother!” is one of the most original films to be released this year, but it is not for the faint of heart. The film is a gut punch as it openly displays and confronts the audience on their sins. This film is one that you will find yourself speaking about days after the credits roll. Just don’t be surprised if you see people leaving the theater before it’s over.